← Episode 15- A new start! Good morning, afternoon and evening, how are you? 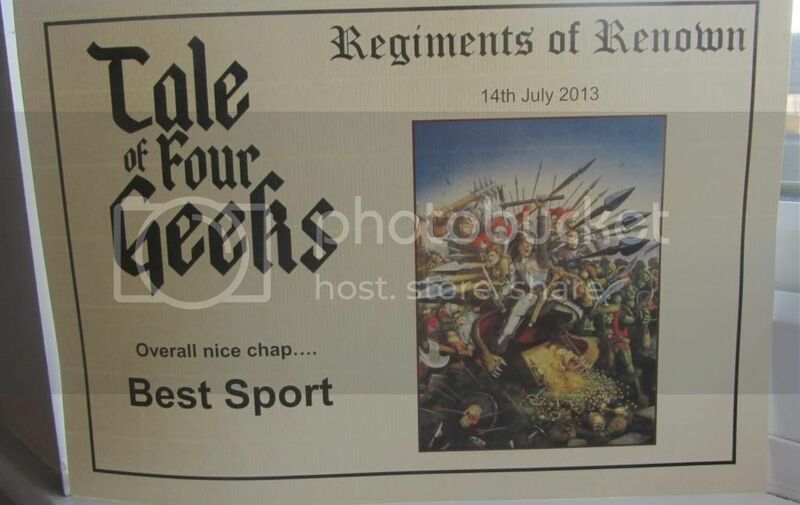 For my first post I will be talking about the T4G Regiments of Renown event which was held on the 14th July 2013. It has been a while since this now, but the T4G guys wanted a “noobs” point of view on the event. After listening to the T4G podcast about GW’s Regiment of Renown event, and then them mentioning that they would be holding their own event locally to me, I just had to join in. The “fluff’ side of the hobby is what keeps me motivated, and being able to base only a handful of models on a theme, was a dream. The only problem was, I had two weeks to buy, model and paint my regiment. I did succeed in completing my regiment on time, including a scenic base, though I do feel it was a bit rushed in the end. 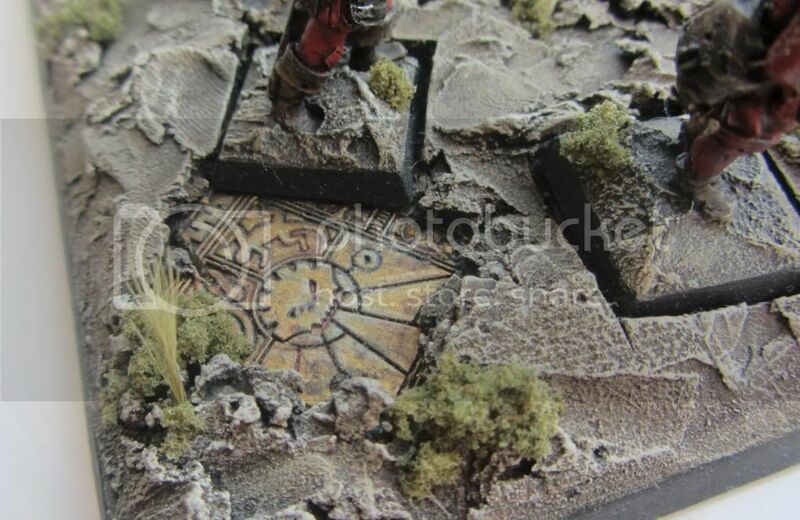 The idea for my regiment was basically in the title of the event (Regiment of Renown) as soon as I heard this I thought of the old Dogs of War army book and that’s when I started searching through eBay and Games Workshop for the models I wanted. I was able to pick up quite a few models from the Pirazzo’s Lost Legion Range, and from this I started list building. 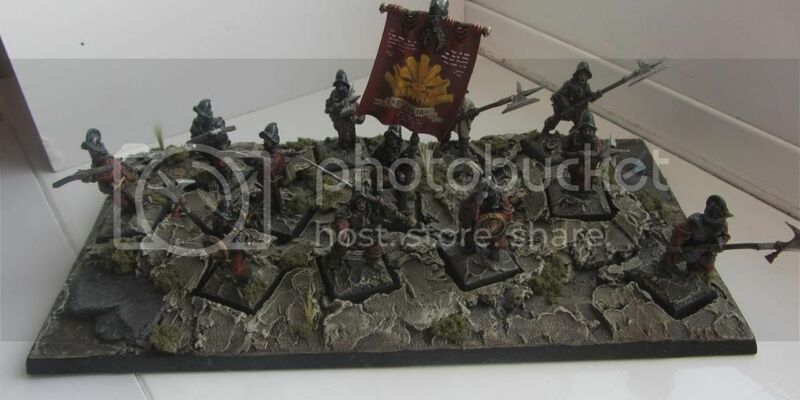 Knowing that my Warhammer skills were not the best I just built a list to accompany the models that I had made, I was able to fit 12 guys in to my mediocre Empire list, using a mix of halberdiers and crossbowmen all led by a single greatsword. I wanted to have the regiment based on the history of the lost legion and actually have some survivors still searching the jungles of Lustria, which I think I achieved? The only thing i regret is that I rushed the actual models of the regiment and I will be going back to these and making some changes, I did manage to do a freehand banner though. As the dust settled and the games were all completed I found myself playing my last two games on the bottom table and actually placing second last in the whole event, I was actually pleased with this, at least I didn’t come last! I think this was due to the durability of my regiment, it was a very mediocre list but at some points in the games certain units excelled but in others I was just getting swept off the table. Some of the highlights of my games were when my Leader (Greatsword) was surrounded by Dryads and Glade Guard and lasted 4 turns in combat whilst taking out half of the enemy force on his own. In another game my three Crossbowmen were on fire, killing everything they hit, though in other games they did nothing with them being restricted by the move or shoot rule. If I were to change my list I would maybe swap out the crossbowmen for archers and even try fit in a knight just for high armour and big impact, because my infantry just dropped like flies only having light armour. At the award ceremony I was totally surprised when my name was called out for “Best Sports” I don’t know how or why, people must have thought I let everyone win their games against me, but no I am just that bad at Warhammer. 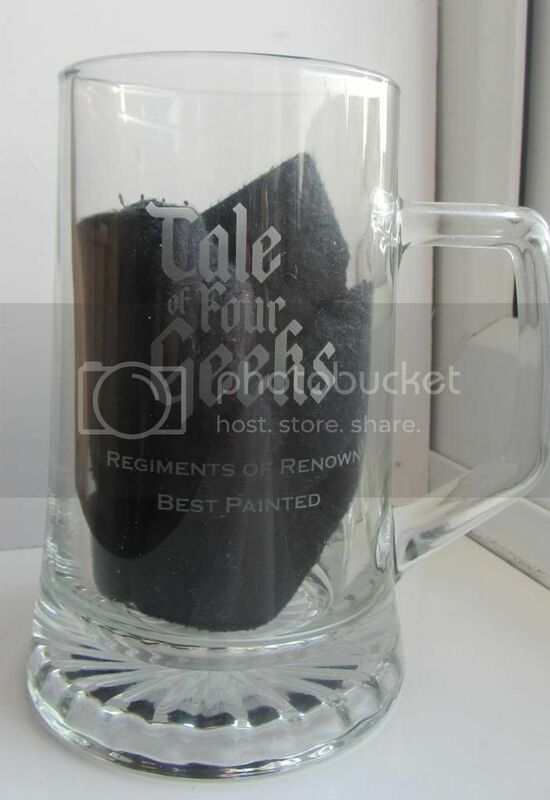 I was then even more surprised to be then told I was joint first for best painted, I thought this was impossible because the quality of Dan Quirks Chaos regiment was beautiful, still don’t know how to this day. All in all I really enjoyed myself, it was a really well organised event and I would really recommend this sort of event to any type of war gamer. I am really looking forward to the next T4G ROR event and I’m already planning my next regiment, I’ll have more time and will even be able to get some test games in before. Hope to see you all there. P.s. This is my first ever post and I hope it is the first of many, please leave some feedback, and even let me know what regiment you’ll be planning for the next event. 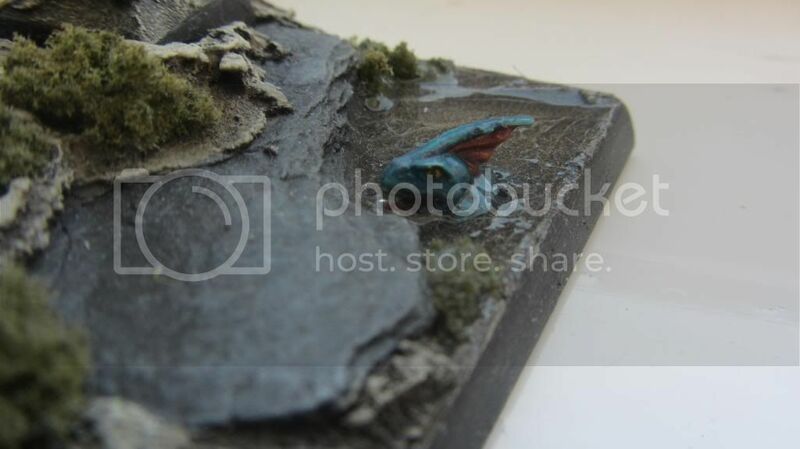 This entry was posted in Regiments of Renown, Warhammer Fantasy and tagged Empire Army, Empire Crossbow, Empire Greatsword, Empire Halberd, Empire RoR, Lustria, Pirazzo, Pirazzo's Lost Legion, regiment of renown, warhammer fantasy. Bookmark the permalink.